I need all of the rare pieces listed above. Can anyone help please??? 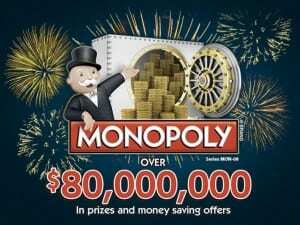 i played the monopoly game last year-2014,and it was a 55 million dollar give-away.i know there are 4-5 another chains,nationwide,so i checked all the prizes for all the chains combined.the total prizes given away was less than 5 million dollars,or 50 million dollars that nobody,nationwide won. statistically,this is almost impossible,so what is really going on. alot of people take the game pieces and never play the game. i imagine quite a few of the winning pieces went in the trash.. I NEED 113B, HAVE ALOT OF OTHERS, LET ME KNOW IF YOU CAN HELP. I WILL HELP YOU. is anyone giving their ticket away just because they have duplicates? I do not think 120C is semi-rare. I managed to find two in a stack of ~20 booklets. These posts do not reflect well on the intelligence of Shaw’s customers. For the big prizes, there are at least two numbers of which only 1 or 2 exist in the world. For the lesser prizes there may be just one. If you have one of these numbers you would be stupid to trade it because, if you are a regular Shaw’s patron, you will most likely will acquire all of the “non-rare” numbers by the end of the game. Let’s use our brains, Shaw’s people. Wake up and smell the “Essential Everyday” coffee! I agree with Jerry – at the very least, find out who in your circle is playing the game and pair up. Dont trade game pieces unless you have extra to spare. Think of the consequences – If you win a big prize, someone on this site will come after you for “their piece of the pie” in a lawsuit. And – That lawsuit would only come if Shaws doesnt come after you for cheating. Either way, you are probably losing that game. Very disappointing. This is not a fair or professional way to run a game for a company that nets billions and just purchased Safeway stores as well in January of 2015. I have #145G for the $10,000 Jet Ski. I’ll split the prize with the owner of #142G. I have the 145G if you are interested. Give me a shout. I will check here. I will split. I have the 145G and I have it up on ebay for sale if anyone is interested. If you have 142G and want to split let me know. thank you. I”m in need of 142G. Email me at wwatts1952@yahoo.com. Thank you. I need 142g….what to do? I have 105A and am willing to sell it. Email me at cfaneca@gmail.com to work something out. If you have piece 146H, please e mail me at nicetomeetyou82@gmail.com and we can split the wining prize! LETS SPLIT!! Need the rates, 142G 153J 146H 138F I have the semi rares to these. Please I’m honest we can meet and get an attorney to do the paper work. Please call me anytime at 805-471-4076 or andersonchristyxx@hotmail.com please I prefer by phone. Thank you. I have 105A. Email me at cfaneca@gmail.com. We can work something out. I also have 105a. message me! I have 137F if anyone needs it. You can decide what its worth. I don’t want it to go to waste. You’ll need 138F to win and that is a harder piece to find. by itself, its no good to anyone unless you have 138F. Do you still need 137? I have it. what duplicates do you have? I just got 137F today. If you have 138f feel free to email me at l.amo90@gmail.com we can do a 40/60 split where you get the 60%. Papers drawn up and all! Thanks! I need all rare pieces. Any help anyone? Willing to split. I have a rare piece 131 E $35,000 vehicle of your choice Does anybody have the other rare 134e we can split or you can make me an offer. Thank you I have never done this before. I don’t know how this works. I have a rare game piece I have 131e The other rare is 134e Does anybody have 134 maybe we can split or make a offer. I’ll split it with you if you still have it! I have 134E. Let’s split it. I have all A pieces except 107a . I am willing to sell entire board (cross posted) for highest offer. Have you made a deal with your game piece yet?? It’s really important. Hoping to take my 17 and 18 year old on their first vacation! Willing to pay out of the prize money for this piece!! I only need 160L for the $1000. Anyone got it??? anyone have 138F? Willing to spilt prize 50/50.email me Jennifer@thenlpgroup.net. People, if the prize is being given out to (3) people – then there are only 3 of that rare piece out there. If the prize is being given to 250 people then there are only 250 rare pieces out there and so on…… (not rocket science). When so many of these prizes do not get claimed at the end of the game, it is simply because many people take game pieces but do not play the game and they go in the trash. It is very plausible that all three of the $1 million dollar rare pieces never even get used and those prizes are never given out to anybody. Just yesterday I saw the guy in front of me take his receipt and his game pieces to the nearest trash barrel on the sidewalk of Shaw’s and toss them all in. Happens every single day. There is no scam here on Shaw’s part, they can’t control what idiots do with their game pieces. I certainly wish people would not accept the pieces if they have no intention of playing, but we all know they will. Why does this very simple game concept seem to baffle so many people?? I have 120C, are you willing to go through a lawyer? I have that piece, but it is not a rare piece…. I also have 120C. I’m even willing to go for a lower price. Please email me at courtlyndvaughan@gmail.com. That’s what I need left for my college tuition…. Huh? I have 7 of them – this is a bogus thread, yes? I have 120-C, let me know if interested. I have 120C. Call me at 781-354-5851. I have 113B, willing to sell, but you’d need 110B to win. I do not have that one. Do you still have your 113 piece? I have 103A 1,000,000 cash prize. I don’t know what other pieces are needed. I’ve got a semi-rare piece for the 131E ($35,000 Vehicle), willing to sell it for $5,000. Yes, Kat, I am still selling 131E. Yes, Kat, I am still selling the 131E for the $35,000 vehicle prize. Are you interested in buying? I have 131 also if anyone has 134. I have 1 rare piece. If you have 134E we could split it. Email me at: jagonga@yahoo.com. I have rare piece 131E. I can sell it to the highest bidder. I can text a photo of it to verify that I own it. I checked Shaws rules and only 1 person can claim a prize. I consulted an attorney, and he said the best way to handle it was to sell my piece. Hi hi, how to split 50/50? I thought this is the vacation home, not cash right??! I have 131E if anyone is interested and has piece 134E.